Half of the time we dedicate to a specific interpreting assignment is often spent on preparation. But while many a thought is given to the actual interpreting performance and the different ways to evaluate it, I hardly ever hear anyone discuss their (or others‘) preparation performance. However, if we want to be good information and knowledge managers rather than mere information and knowledge workers, we need to close the management cycle and put extra effort into checking if our work serves its purpose and making possible adjustments to optimise it. Efficiency being the ratio between input and output (how much do you spend to make a dollar? ), the question now is what to measure in the first place. Admittedly, the efficiency of information and knowledge work is not the easiest thing to measure. Apart from the fact that whilst interpreting we have other things to worry about, it is hard to tell the difference between the way we actually interpret and the way we would have done without the most essential part of our information work, i.e. preparation. Strictly speaking, previous work experience and knowledge acquired outside the interpreter’s professional life also count as „preparation“ and can even be more helpful than preparation in the stricter sense. How much time do you spend to make a useful information unit? As it happens, back in 2006 I conducted a case study to check exactly this: a conference interpreter’s preparation effort in relation to its usefulness. As a baseline, I decided to use the terminology prepared for a technical meeting, assuming that this is what comes closest to a quantifiable amount of information. Even if preparation is not all about terminology (or glossaries), it is an important part, and if it is well done, it covers semantics and context information as well. So in order to get a number representing the output, I simply counted all the terminological units prepared for one meeting (376) and afterwards had the interpreter count those units that actually came up in the meeting (197) so that the terms prepared „in vain“ could be deducted. I then calculated the percentage of the used terms in relation the total amount of elaborated terms, the so called usage rate. In the case study the overall usage rate at the conference at hand was 52%. The usage rate of terminology from a previous conference of the same client about the same subject was 48 % (81 out of 168 terminological units). This has of course no statistical significance whatsoever, but it can surely be a useful indicator for the individual interpreter. And interestingly, when repeating this exercise with my students from now and then, the results are usually of a similar order of magnitude. Once the output (terms used) has been determined, it can be related to the input. Assuming that the input is mainly the time spent on preparing the terminological units that came up in the conference, this time is divided by the terms used in order to obtain the relative or average time spent per terminological unit. This value can be considered an approximation to the efficiency of the interpreter’s information work. 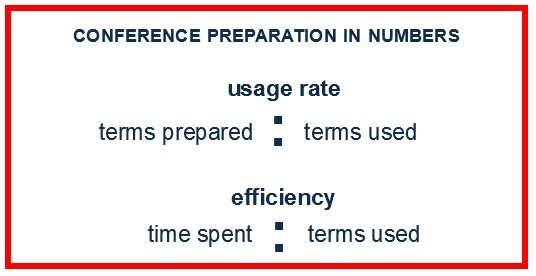 In the case study the average time spent per term used was 5 minutes (9.5 hours for 113 terms). When repeating this exercise with students, this value usually ranges roughly from 1 to 10 minutes. Such numbers of course merely serve to quantify the information work we do. In order to really complete the management cycle and find out in how far preparation could possibly be optimised, a closer look needs to be taken at the quality of information and knowledge gaps that occur during the interpreting assignment at hand and how they are or could be handled – which is a different story altogether.